Did Jesus really die on Friday and rise on Sunday? How can we answer the skeptics that rightly question the contradiction with Scripture that this tradition presents? 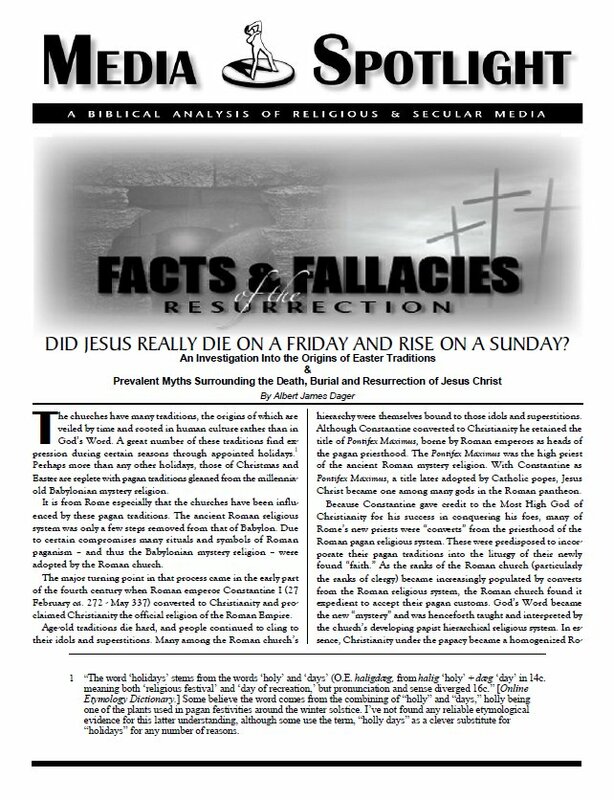 This in-depth study proves that Jesus was in the tomb for three full days and three full nights just as He prophesied, and that He did not rise on a Sunday morning. Challenging Easter traditions that originated with pagan beliefs and practices, this study also chronicles the origins of the Easter bunny, colored eggs, and other unlikely elements associated with the Lord's resurrection. HALLOWE'EN - SHOULD CHRISTIANS BE APART? It's the time of year when the world holds its festival to honor the powers of darkness. Yet many Christians associate Hallowe'en with faith in Jesus Christ. They think nothing of masquerading as ghouls, goblins and other evil characters. Some believe it is better to have harvest festivals in place of "Hallowe'en parties." But that's what the feast of Samhein, held on October 31, is: a harvest festival in honor of the pagan god and goddess. Learn how modern witchcraft has targeted your children through the celebration of this sacred pagan festival. This study outlines the true nature of Hallowe'en from both its pagan and so-called "Christian" origins. 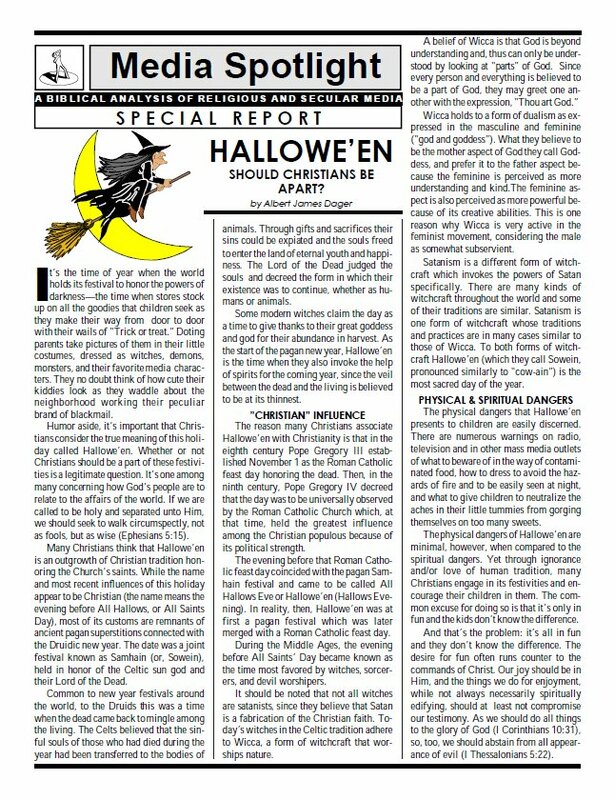 Written in 1977, this was a landmark report that stirred many Christians to reconsider their part in this pagan festival. There is little question that the day many Christians celebrate the birth of Jesus is not, in fact, His birthday. Nobody knows the exact date of His birth. The problem with many of today's traditions is that the true origins are lost to antiquity, and much of what is believed is based on ancient pagan myths. 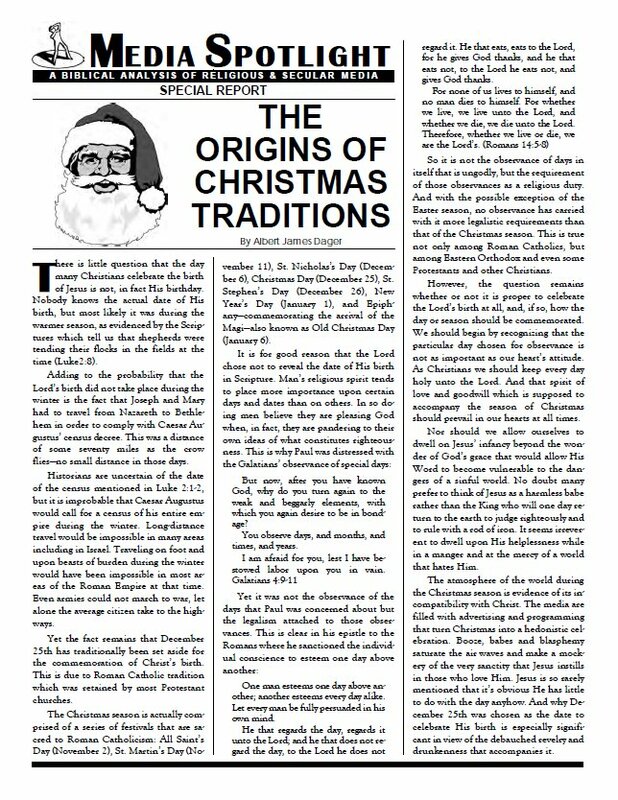 It would take volumes to detail all the pagan origins of Christmas traditions, but for practical purposes we can trace most of what is believed and praticed in the churches back to Roman Catholic tradition. Some of these are relatively harmless, but many are so pagan that they should be offensive to the true believer in Jesus. This report helps sort out the differences.